On the 19th of May 2004 Avie Tevanian, then Apple Chief Software Technology Officer told a technology conference that Apple would slow the pace of its operating system releases. The next one, Mac OS X 10.4, codename Tiger, was not to follow the “one major release per year” rule kept in the past years and would be closer -in development and release- to a 20 month cycle. The dates show us that it took only 6 months to go from 10.0 to 10.1 and that 10.2 was released the following year: this reinforces the common opinion of “Puma” as a quick and much-needed fix for a still incomplete and immature operating system. So we have 11 months between “Puma and “Jaguar” and 14 months until “Panther”. Mac OS X 10.4, “Tiger”, was released after 18 months, more or less as stated by Tevanian. On the other hand it took 30 months for “Leopard” to come out and the wait for 10.6, codenamed “Snow Leopard”, could be in the same ballpark. Apple has stated it will show and give an almost complete “developer release” of 10.6 at the 2009 WWDC which means the sixth version of Mac OS X won’t come out before 24 monthts: maybe even a bit longer if we take into account Apple’s fondness of releasing during Autumn or Spring. 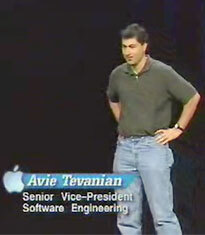 The picture of Avie Tevanian (from the 1999 WWDC) is “courtesy of Apple”.